While strolling through Citta’ Della Pieve, a northern Umbrian town during the Festa dello Zafferano held each fall, you will pass shops with baskets of lilac colored crocus petals and zafferano packets. During this festival, sprays of crocus flowers decorate textile shop windows, toy shop entrances and the Gelaterie which features ice-creams and yogurts made with saffron. In the Piazza Matteotti, a young chef teaches a cooking class with saffron starring in every dish: yellow risotto, saffron bread and a dessert. Just around the corner in the Palazzo della Corgna, you’ll find the embroidery work of the local women, including textiles of yellow hues, dyed with saffron. In the covered market area, you’ll see saffron-dyed candles and even creams and soaps made with saffron. Saffron, the red-orange stigmas from the center of the fall flowering crocus plant (Crocus sativus), is the world’s most expensive spice. That’s because each flower provides only three stigmas. One ounce of saffron = approximately 14,000 of these tiny saffron threads. The tiny threads of saffron must be handpicked from the flower. The yellow stamens which have no taste are left behind. This spice comes either powdered or in threads. The ancient Greeks and Romans prized saffron for its use as a perfume. They scattered it about public spaces such as royal halls, courts and amphitheaters. When Emperor Nero entered Rome, they spread saffron along the streets and wealthy Romans made daily use of saffron baths. They also used saffron as mascara, stirred saffron threads into their wines, strewn it in the halls and streets as a potpourri and offered it to their deities. Roman colonists took saffron with them when they settled in southern Gaul, where it was extensively cultivated until the AD 271. Saffron cultivation in Europe declined following the fall of the Roman Empire. For several centuries thereafter, saffron cultivation was rare or non-existent throughout Europe. This was reversed when the Moors came from North Africa to settle most of Spain, as well as parts of France and southern Italy. Two centuries after their conquest of Spain, the Moors planted saffron throughout the southern provinces of Andalucia, Castile, La Mancha and Valencia. During the Renaissance, Venice stood out as the most important commercial center for saffron. In that period saffron was worth its weight in gold and, even today, it is still the most expensive spice in the world. Unfortunately, its high price led to its adulteration which, in those times, was severely punished. Henry VIII, who cherished the aroma of saffron, condemned adulterers to death. Saffron grows on the Navelli Plain in the Province of L’Aquila and is considered by many to be a major product of the Italian Abruzzo region. How a flower of Middle Eastern origin found a home in Italy can be attributed to a priest by the name of Santucci, who introduced it to his native home over 450 years ago. Following his return from Spain at the height of the Inquisition, Santucci was convinced that the cultivation of saffron was possible in the plains of Abruzzo. Nevertheless, even today, the harvesting of saffron is difficult work and great skill is needed to handle the stems without damaging the product or allowing contamination from other parts of the plant. An essential ingredient in Risotto Milanese, saffron is also used in many other dishes across Italy. For example, the fish soup found in Marche region, uses saffron for its red coloring in place of the more traditional tomato in the recipe. This coloring property is also widely appreciated in the production of cakes and liqueurs and, for centuries, by painters in the preparation of dyes. Its additional curative powers have long been believed to help digestion, rheumatism and colds. American saffron or Mexican saffron is actually safflower, a member of the Daisy family and the same plant from which we get safflower oil. Although its dried, edible flowers do yield the characteristic yellow color, it has no flavor and is not suitable as a saffron substitute. Turmeric, also known as Indian saffron, is an honest substitute for saffron, but it is a member of the ginger family. Use turmeric sparingly as a saffron substitute, since its acrid flavor can easily overwhelm the food. Turmeric is also used to stretch powdered saffron by unscrupulous retailers. Unfortunately, there is no truly acceptable substitute for saffron. Its distinctive flavor is a must for classic dishes such as paella, bouillabaisse and risotto. If your recipe calls for saffron, do yourself a favor and use the real thing to fully appreciate the intended result. A classic Italian appetizer that is often served with olives. In a small saucepan, heat the butter over medium-low heat until melted. Add the flour and stir until smooth. Over medium heat, cook until the mixture turns a light, golden color, about 5 minutes. Meanwhile, heat the milk in a separate saucepan until just about to boil. Add the hot milk to the butter mixture, a little at a time, whisking continuously until very smooth. Bring to a boil. Cook 10 minutes, stirring constantly, then remove from the heat. Season with salt and nutmeg and set aside until ready to use. Peel the eggs, cut them in half and remove the yolks. Set the white halves aside on a serving platter. Mash the yolks in a small bowl. Add the saffron to the bechamel sauce and mix well. Add the mashed yolk and stir until the egg yolks are completely dissolved. Fill eggs halves with a little of the sauce and garnish with ground saffron. Heat oil in a large saucepan over medium heat. Add onion and celery; cook, stirring constantly, for 3 minutes. Add garlic, thyme, fennel seed, salt, pepper and saffron; cook for 20 seconds. Stir in tomatoes, clam broth and green beans. Bring to a simmer. Cover, reduce heat and simmer for 2 minutes. Increase heat to medium, stir in scallops and cook, stirring occasionally, for 2 minutes. Add shrimp and cook, stirring occasionally, for 2 minutes more. Put the crushed saffron threads in a cup. Add 1-1/2 tablespoons hot water and let stand 30 minutes. Place the saffron water in a food processor with the 3 eggs and puree. Add remaining ingredients and process until the dough forms a ball. Cover kneaded dough with plastic wrap and refrigerate at least ½ hour. Preparing the dough with a hand crank pasta machine: Divide dough into 3″ x 2″ pieces. Dust the dough lightly with flour on both sides. Start with the first thickness on the machine and gradually crank in steps to the desired thinness. After the first pass through the machine, fold the dough in half to help develop the gluten. To make good straight edges, fold the ends of the pasta sheet to the center and then rotate it 90º so that the folded edges are on the sides. Place rolled pasta sheets on floured kitchen towels. After all the pasta sheets are formed, cut the pasta into spaghetti or fettuccine on the pasta machine. As soon as you cut the pasta, either place on a floured flat surface or hang on a pasta drying rack. Homemade pasta will stay fresh in the refrigerator for a few days, or it can be air dried on your pasta rack and then stored in an airtight container. Fresh pasta can also be frozen in a vacuum bag. Do not keep dried fresh pasta unrefrigerated because it contains eggs in the mixture. Cooking Hand Made Pasta: Drop the pasta into a large pot of salted boiling water and boil until tender or “al dente” for about two to three minutes. Do not over-cook the pasta. Drain well and serve with your favorite sauce. Saffron flavored pasta is especially good with butter and parmesan cheese. It also makes a delicious side dish to Chicken Marsala. Season chicken with salt, pepper and dredge in flour. Heat the olive oil in a heavy skillet over medium high heat. Add the chicken and saute until lightly browned on both sides. Then transfer to another plate; cover with foil to keep warm. Add butter to the same skillet and heat until its starts to sizzle. Add the shallots and saute for about 5 minutes..
Add the wine to the pan. After a minute, slowly whisk in the cream, blending completely. Add the saffron and simmer for a minute. Add the chicken back into the pan, lower heat, cover and cook for 5 minutes or until the chicken is done. Plate chicken, pour sauce over the top and garnish with chopped chives. Place the oranges in a large saucepan and add enough water to cover. Bring to a boil and cook for 2 hours over medium heat. Check occasionally to make sure they stay covered with water. Allow the oranges to cool, then cut them open and remove as much white pith as possible and the seeds. Process in a blender or food processor into a coarse pulp. Preheat the oven to 350 degrees F. (190 degrees C) Thoroughly grease a 10-inch round cake pan and line the bottom with parchment paper. Sprinkle with powdered sugar. In the large bowl of an electric mixer beat the eggs and sugar together until thick and pale, at least 10 minutes. Mix in baking powder and saffron. Stir in the pureed oranges. Gently fold in almond meal and candied orange peel; pour batter into the prepared pan. Pumpkin Decorations in a Piazza in Rome. Just a few decades ago Halloween in Italy was merely the name of an American holiday. Little by little Halloween’s popularity has grown, probably due to the influence of American movies and American fast food chains. It has become a real celebrated holiday, even though it doesn’t have any real connection to Italy. All Saints Day (November 1st) is celebrated there as a national holiday and November 2nd, a day dedicated to the remembrance of the dead, is a holy day during which people visit cemeteries and bring flowers and candles to remember relatives and friends who have passed away. 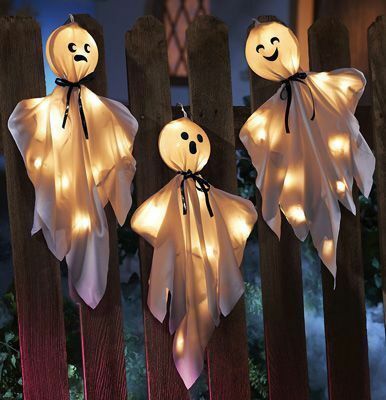 In Italy, Halloween involves costume parties for young adults and shops are beginning to sell decorations and even a variety of Halloween costumes (although the selection is still mostly limited to bats, ghosts or witches). While many of Italy’s Halloween traditions are similar to America, there are some that are uniquely Italian. To experience a distinctly Italian Halloween, visit the small hill town of Corinaldo in the Marche region for La Notte delle Streghe – The Night of the Witches. Throughout Italy you will often see carved pumpkins, children in costumes running through the piazza and signs for Halloween parties at local restaurants or clubs. Some areas offer Halloween tours of medieval towers, castles and catacombs that are lined with mummies and bones. Celebrations are now widespread enough that it’s safe to say Halloween has been adopted into the Italian culture. The concern of traditionalists is that it has replaced the more traditional religious practices. The tradition of the pumpkin is not exclusively Anglo-Saxon, in fact, it can also be found in the Italian tradition. In Veneto, for example, pumpkins are emptied, painted and a candle symbolizing resurrection is placed inside them. In Friuli, especially in the area near Pordenone, the pumpkins, prepared in this way, are put along the roads to light the path for the dead. In Puglia every family adorns their own pumpkin and puts it on display in the window of their house. In Lombardia pumpkins are filled with wine, so that the dead can drink it during the night between the 31st October and the 1st of November, before returning to the kingdom of “afterlife”. The traditions also include typical dishes prepared during this time and handed down from generation to generation. In Romagna, a region well known for its cuisine, the “piada dei morti”, a round flatbread filled with nuts, almonds, raisins and the red wine of Romagna, Sangiovese, is prepared. Another sweet prepared during this time is the “fava dei morti”, a little biscuit made of almonds. In Sicily the typical dishes for this time of year are the “pupi ‘i zuccuru”, a sweet bread shaped like little dolls, and the “dead bones” biscuits having the shape of bones that are particularly hard to bite. Cut off the top cap of the pumpkin, remove all the seeds and filaments keeping the pumpkin whole. You will form a sort of soup tureen complete with its lid. Melt the butter in a small pan over medium heat. Add chopped celery, parsley, basil and thyme. Cook for 2 to 3 minutes. Fill the pumpkin 3/4th of the way up with vegetable broth, the sautéed vegetables, peeled garlic and the grated cheese. Add salt and pepper to taste. Stir well and cover the pumpkin with its top and place on a baking sheet. Bake at 450° F for two hours. Remove the pumpkin from the oven, remove the top and let cool. Remove the garlic and, with a serving spoon scrape the pumpkin off the sides and bottom, mixing it slowly into the soup, to make a puree. Should the puree be too thick, add some more hot stock to it. Serve in soup bowls with a couple of drops of balsamic vinegar and large pieces of shaved Parmigiano Reggiano. You can use turkey or chicken scaloppine in place of the veal. Gently saute the onion in 2 tablespoons of olive oil until lightly golden and then add the pumpkin slices. Salt and pepper the pumpkin and cook over low heat for 20 minutes, covered. Mash the pumpkin into a puree and add the grated Parmesan. Set aside. Place the pounded slices of veal on a work surface and spread each one with pumpkin puree. Roll them up tightly and roll in flour. Melt 2 tablespoons of butter in a skillet and brown veal rolls, about 6 minutes. You may need more butter. Add enough wine to cover the bottom of the pan and allow it to evaporate. Cover the pan and cook the veal rolls for 6-8 minutes more. Finely chop the chicory and add it to a skillet containing 1 tablespoon of olive oil; add the almonds and salt and pepper. Cook until the chicory wilts. Serve the veal rolls over the chicory mixture. Lightly toast the anise seeds either in the oven or on the stove in a saute pan over medium heat constantly shaking the pan, 3 to 4 minutes. Remove the seeds from the pan, allow to cool, and set aside. Grind the hazelnuts in a food processor pulsing until the mixture looks like coarse cornmeal. Pour into a bowl and set aside. Grind the anise seeds in a small spice grinder until the seeds are half their size and place in the bowl with the nuts. In the bowl of a electric stand mixer with a paddle attachment, cream the sugar, butter and lemon zest until light and fluffy, 3 to 4 minutes. Add the egg whites and vanilla and mix on low speed until incorporated, 1 to 2 minutes. In the bowl with the ground hazelnuts and anise, add the flour, cinnamon, black pepper, cloves and salt and mix with your hands until combined. Add the dry mixture to the wet mixture in the mixer on low speed until a smooth ball of dough forms, 1 to 2 minutes. Remove the dough from the bowl, flatten slightly and wrap the dough in plastic wrap. Chill for 30 minutes. Divide the cold dough into 8 even pieces. Roll each piece into a rope approximately 18-inches long by about 1/2-inch thick. Cut the ropes into 5 cookies. For super long bonz, roll each log 8-inches long. Place the bonz on parchment lined baking sheets and allow to sit uncovered in a dry place, 1 to 2 hours or up to overnight. This helps them become super dry and ready for baking. Place the baking sheets in a preheated 350 degree F oven and bake until golden brown, 12 to 15 minutes. Remove from the oven and allow to cool completely on a wire rack. Dust with powdered sugar before serving. Said to be based on an ancient Etruscan recipe, this particular recipe is a specialty of the Lombardia region of Italy. These cookies are best eaten the day they are baked, although they keep well for several days. They are dense, chewy, moist cookies with the crackle of the ground cookies and the crunch of the pine nuts to remind us of dead men’s bones. In a processor finely grind the cookies and amaretti and place in a very large mixing bowl. Finely grind both the almonds and the figs and add to the cookie crumbs in the bowl. Add the flour, sugar, cocoa powder, baking powder, cinnamon, nutmeg, salt and whole pine nuts to the ground ingredients and toss until completely blended. Pour the egg whites and the vin santo or dessert wine over the dry ingredients and blend until all of the dry ingredients are moistened. Scrape out onto a floured work surface and knead quickly until it you have a smooth, well-blended ball of cookie dough. Preheat the oven to 350°F (180°C). Line baking sheets with non-stick parchment paper. Slice the ball of dough in half and then each half into about a dozen even pieces, each weighing about 3-3 ½ oz (90-100 g). Form each piece into an oblong shape – long and flat, approximately 4 ½ – 5 ½ inches (12-14 cm) long and approximately 2 ½ inches (6 cm) wide, (wider in the middle and narrowing to a point at each end). Place the cookies on the baking sheet leaving a little space between each. Bake for 35-30 minutes until slightly puffed, a dull brown color and set to the touch. Lift one up carefully and check that the bottom side looks cooked. Do not overbake or the cookies will be too hard. Remove the cookies to cooling racks and allow the cookies to cool completely. Once cooled, sift powdered sugar generously to cover the cookies. Fave dei Morti, beans of the dead, are little bean-shaped cakes that Italians eat on Il Giorno dei Morti (All Souls’ Day) on November 2. These small cakes are traditionally eaten throughout Italy on the day that everyone decorates the graves with flowers and prays for departed souls. Combine sugar, butter and ground almonds. Beat egg and add to the butter ingredients, mixing thoroughly. Add flour and lemon rind. Work dough until smooth and form into a roll about 1 1/2 inches in diameter. Wrap in waxed paper and refrigerate 2-3 hours. Cut off bits of dough and mold into kidney-shaped pieces about as big as large lima beans. Bake on greased cookie sheets in a moderate oven (350° F.) about 15-20 minutes, or until golden brown. Cool 5 minutes before removing from the pan with spatula to a cooling rack. The two most common major species of walnuts are the English Walnut and the Black Walnut. The English Walnut originated in Persia and the Black Walnut is native to eastern North America. The Black Walnut is full of flavor, but due to its hard shell and poor hulling characteristics, it is not grown commercially for nut production. The commercially produced walnut varieties are nearly all hybrids of the English Walnut. The United States is the world’s largest exporter of walnuts. The Sacramento and San Joaquin Valleys of California produce 99 percent of the nation’s commercial English Walnuts. The walnut harvest season in California typically runs from late August through late November. Once the outer green hull of the walnut begins to dry and split, the nuts are ready for harvest. Thanks to their sturdy shells and leathery outer husk, walnuts are exceptionally well-protected from pests and rot. If stored and handled properly, they can be consumed up to one year after harvest. The orchard floor is swept for debris and then a mechanical shaker is employed to vigorously shake each tree trunk, knocking the ripe walnuts off their branches and onto the cleared orchard floor. A separate machine is used to sweep the walnuts into neat rows so that mechanical harvesters can pick them up off the ground efficiently. Shaking the walnuts out of the tree. When consumed fresh from the tree, walnuts have a softer texture and a creamy, slightly bitter flavor. At this stage, they typically have a 20 to 25 percent moisture level. After the walnuts are cleaned and the leathery outer husk is removed, one of the first processing steps these walnuts will undergo is mechanical drying. Even those walnuts sold in the shell will be dried to achieve an 8-percent moisture level, which results in a taste familiar to consumers’ palates and also protects the nuts from rot. While a little less than half of exported walnuts are sold in the shell, only about 5 percent remain in the shell stateside. The other 95 percent are cracked to order, as storing the nuts in their shells extends their shelf life. After being initially screened for any debris, the nuts are air-separated from the cracked shells and sorted into a variety of sizes and colors. Generally speaking, lighter-colored intact halves sell at a premium price, while smaller darker pieces are sold at a lower price. Workers inspect the processed nuts to ensure that they are clean, properly dried and of the correct size and color for the particular order at hand. After this step, the nuts are packaged and shipped. Additionally, a small sample is removed from each batch and sent for laboratory tests to ensure that they meet all food safety regulations set forth by the California Walnut Board, the USDA and the FDA. When shopping, look for unblemished, clean-looking, creamy colored walnuts. If you are buying shelled walnuts, choose walnut halves for eating and decoration and broken nuts for garnishing or baking. Bags should have little or no “dust” which occurs with handling. To avoid rancidity, refrigerate or freeze shelled walnuts in an airtight container and store nuts in the shell in a cool dark cupboard up to six months or refrigerate. One quarter cup of walnuts provides 90 percent of omega 3s known to benefit heart health and cognitive function. Walnuts also contain ellagic acid which supports the immune system and may fight cancer. Just 4 walnuts a day can be beneficial. Walnuts are good in pasta, cereal, cooked vegetables, fruit or green salads or baked goods. They can be pureed into a walnut butter. Melt the butter in a medium saucepan over medium-low heat. Add the olive oil and onion, season lightly with salt and pepper and stir to combine. Cook for 20 – 30 minutes, stirring frequently— until the onions are lightly brown. Transfer to a small bowl and set aside. Wrap the carrot, celery, shallot and bay leaf in a double thickness of cheesecloth and tie the bundle securely with twine. Place in a medium saucepan, pour in the milk and season with 1/4 teaspoon salt and 1/8 teaspoon pepper. Bring to a simmer over medium-high heat. Add the walnuts, reduce the heat, and poach in the simmering milk for 20 minutes, stirring once or twice. Strain the mixture, reserving the milk and walnuts separately. Discard the cheesecloth bundle. While the walnuts are still warm, put them in a food processor. Add 1/3 cup of the reserved milk and puree. Add additional milk by tablespoons, until the mixture is smooth and spreadable. Season to taste with salt and pepper, transfer to a bowl and set aside. Any remaining milk may be used in a soup or sauce. Brush the baguette slices lightly with olive oil, put them in a single layer on a baking sheet, and place in a preheated 350ºF oven for about 5 minutes, to dry and crisp the bread. Remove from the oven and gently rub each slice with garlic. Spread about 1 tablespoon of the walnut mixture on each crostini. 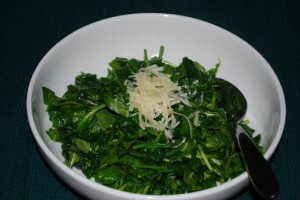 In a small bowl toss the arugula with 1 tablespoon olive oil, then season lightly with salt and pepper. Place a few leaves of arugula over each crostini and top with about 1/2 teaspoon of caramelized onions. Spread the walnuts on a rimmed baking sheet. Roast until fragrant, 5 to 6 minutes; transfer to a food processor and let cool. Heat 1 tablespoon oil in a large skillet over medium heat. Add the onion, season with 1/4 teaspoon each salt and pepper and cook, covered, stirring occasionally, until tender, 6 to 8 minutes. Add the wine to the onions and simmer for 2 minutes. Add the remaining 1 cup broccoli florets and cook, tossing, until heated through. Cook the pasta according to package directions. Reserve 1/2 cup of the cooking water, drain the pasta, and return it to the pot. Add the walnut pesto and the reserved pasta cooking water and mix. Add the onion mixture and toss to combine. Serve with a squeeze of lemon juice, additional Parmesan and herbs. Place a medium-small skillet (one that has a tight-fitting lid) over medium heat and wait about 1 minute. Pour in 2 tablespoons of the olive oil and swirl to coat the pan. Add the uncooked bulgur and sauté over medium heat for about 5 minutes. Keep stirring during this process to be sure it doesn’t burn. Pour in the water, place the lid on the pan, and turn off the heat. Let stand 30 minutes. After 30 minutes, fluff with a fork as you add the remaining tablespoon of olive oil and the lemon juice. Stir in the chives, dill, parsley and feta and then add salt and pepper to taste. Stir in the walnuts and apricots. Preheat the oven to 375°F. Lightly oil a baking dish large enough to fit the peppers. Slice the top off each pepper; reserve the top. Reach inside the peppers with a spoon to scrape out the pith and seeds. Spoon a 1/2 cup of stuffing into each pepper. Place the tops back on the peppers. Brush the outside surface of each pepper with a little additional olive oil and place them standing upright in the prepared dish. Bake for 35 minutes in the center of the oven. Let sit for at least 5 minutes; serve hot or warm. Place the butter in a small saucepan and melt over medium heat. Cook for 5-10 minutes, until the butter begins to take on a light-brown color and gets a nutty aroma. Add the walnuts and cook for one minute. Pour in the lemon juice, turn up to high heat, and bring to a boil. Turn off the heat, and add the basil, salt and fresh ground black pepper to taste; reserve. Season the fish filets with salt and fresh ground black pepper to taste. Sauté the fish in the olive oil over medium-high heat until done. Serve hot with the butter sauce spooned over. Heat oil in a heavy saucepan over medium heat and sauté bacon until just cooked but not crisp. Add shallots and cook until translucent. Add mushrooms and continue cooking until water evaporates, about 5 minutes. Transfer mixture to a large mixing bowl and let cool. Add salt, pepper, Worcestershire sauce and egg to mixture. Add beef and gently mix by hand until all ingredients are incorporated, without overmixing. Divide mixture into 16 equal portions. Form into thick patties, about 1-1/2 inches thick and 2-1/2 inches in diameter, tuck a piece of cheese and 2 walnut halves into the center of each patty. In a medium saucepan over medium heat, bring water, sugar and cocoa powder to a boil, whisking constantly. Reduce heat and simmer until sugar is completely dissolved and cocoa is well blended, about 1 minute. Remove from heat and stir in bittersweet chocolate until melted. Let cool completely. Stir in Kahlua and walnuts. Cover and refrigerate until completely cold, about 4 hours. Spoon chilled chocolate mixture into a shallow metal pan; freeze until almost firm, about 3 hours. Break into chunks; purée in a food processor. Pack into an airtight container and freeze until firm, about 1 hour. With an ice cream maker: transfer chilled mixture to ice cream maker and prepare according to manufacturer’s instructions. In Italy, fashion is almost a national passion and to see the latest trends, one need only glance around the various piazze, restaurants and streets. Interestingly, these are trends worn to show off the best of the wearer and limit the flaws: individual Italians for the most part follow trends that suit them. Besides, few fashion conscious Italians would go for something trendy that is not also durable, classic and genuine. An Italian woman striding down the cobbled streets in the latest ultra-high wedges without missing a step and with hair flying in the breeze, epitomizes an attitude almost all Italians have: of dressing with care and confidence. For Italians, fashion is not about the clothes but about an attitude; an attitude of sophistication. Giorgio Armani (born 11 July 1934) is an Italian fashion designer, particularly noted for his menswear. He is known for his clean, tailored lines. He formed his company, Armani, in 1975 and by 2001 was acclaimed as the most successful designer in Italy. Armani was born in the northern Italian town of Piacenza, where he was raised with his older brother, Sergio and his younger sister, Rosanna by his mother, Maria Raimondi and father, Ugo Armani. Armani aspired to a career in medicine and enrolled in the Department of Medicine at the University of Milan. However, after three years, he left the university and joined the army. Because of his medical studies, he was transferred to an infirmary in Verona. It was, then, he decided to find a different career. After his discharge from the military, Armani found a job as a window dresser at La Rinascente, a department store in Milan. He went on to become a salesman for the menswear department, where he gained valuable experience in the marketing area of the fashion industry. In the mid-1960s, Armani moved to the Nino Cerruti company and designed menswear. His skills were in demand and for the next decade while continuing to work for Cerutti, Armani freelanced, contributing designs to as many as ten manufacturers at a time. In the late 1960s, Armani met Sergio Galeotti, an architectural draftsman, which marked the beginning of a personal and professional relationship that lasted for many years. Galeotti persuaded Armani to open a design office in Milan and this led to a period of collaboration with a number of fashion houses, including Allegri, Bagutta, Hilton, Sicons, Gibò, Montedoro and Tendresse. The international press was quick to acknowledge Armani’s importance following the runway shows at the Sala Bianca in the Pitti Palace in Florence. The experience provided Armani with an opportunity to develop his own style. He devoted his energy to his own label and in 1975 he founded Giorgio Armani S.p.A. in Milan, with his friend Galeotti. In October of that same year, he presented his first collection of men’s ready-to-wear for Spring and Summer 1976 under his own name. He also produced a women’s line for the same season. In 1979, after founding the Giorgio Armani Corporation, Armani introduced and produced the Mani line for men and women in the United States. The label became one of the leading names in international fashion with the introduction of several new product lines, including G. A. Le Collezioni, Giorgio Armani Underwear and Swimwear and Giorgio Armani Accessories. Giorgio Armani has a keen interest in sports. He is the president of the Olimpia Milano basketball team and an Inter Milan fan. He has twice designed suits for England’s national football team and he designed suits worn by players of the London club, Chelsea. Armani designed the Italian flag bearers’ outfits at the opening ceremony at the 2006 Winter Olympics in Turin and also designed Italy’s Olympic uniforms for the 2012 Summer Olympics in London. Armani’s place of birth, Lombardy, is bordered by the region of Piedmont to the west, Emilia-Romagna to the south, Veneto and Trentino-Alto Adige to the east and Switzerland to the north. Lombardy is surrounded on all sides by very distinctive local cultures. Culinary influences are equally diverse owing to Lombardy’s varied terrain, cooking styles and long history of influence from nearby nations. With such a heritage, cooking traditions are ingrained and recipes have not changed for centuries. Rice grows very well here, so it’s no surprise that risotto dishes find their way onto almost every table. The cattle industry is booming, providing beef for a variety of well known dishes. Cattle also provides for an equally thriving dairy industry, so much so, that butter and cream are used much more liberally than the traditional olive oil. Agri d’ Valtorta, Gorgonzola, Parmigiano-Reggiano and Provolone Valpadana are just a few of the many excellent cheeses crafted in Lombardy. Peppers, greens and lettuces, pumpkins, potatoes, onions and tomatoes are all abundant. Stews, soups, heavily-sauced polentas, hearty filled raviolis and slow-braised meat dishes are all favorites. Heat a third of the butter in a small saucepan. Dice the figs and add to the heated butter and sauté for about 5 minutes. Remove from the heat and set aside. Heat another 1/3 of the butter in a saucepan over medium heat until hot. Add the onion and cook until translucent and softened, about 8 minutes. Do not let the onions brown. Add the rice and stir to coat each grain and saute until they are opaque, about 4 minutes. Add the white wine and cook until all the liquid is absorbed, about 3 minutes. Add 1/2 cup of simmering broth and stir until almost completely absorbed. Continue cooking the rice by adding the broth one ladle at a time, stirring constantly and allowing each addition of broth to be absorbed before adding the next. Continue this process until the rice is tender and creamy, yet still firm to the bite (al dente), about 22 minutes total. 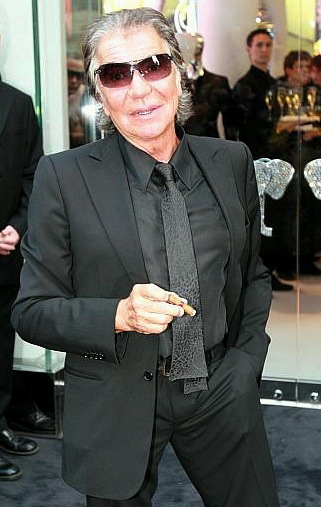 Born in Florence, Italy on November 15, 1940, Roberto Cavalli was very much destined for an artistic career. As the son of a tailor, he was exposed to the fundamentals of design and sewing; skills he would carry from childhood to that of designer. Cavalli’s grandfather, Giuseppe Rossi, was an impressionist painter whose works can be found in the halls of the Uffizi Gallery in Florence. Acquiring a significant creative sense from his family and fueled by an already existent artistic ability, Cavalli realized he had ability as a painter. Eventually uniting his painting talent with his ability for working in fabric, Cavalli became a talented fashion designer. He was captivated with the connection between fabrics, painting and art that he experimented with unusual fabrics and designs while continuing his studies at the Academy of Arts. Through detailed and thorough research, coupled with modern technology, Cavalli invented the process of printing onto lightweight leather; a process he went on to patent later. As he said in one of his interviews, “I had this idea to print on leather. I used glove skin from a French tannery and when I started to print, I saw it was possible to make evening gowns in leather in pink—unbelievable.” Cavalli is most widely known throughout the art and fashion worlds as a gifted leather designer. Through the combination of lightweight leather and paints, Cavalli created a new frontier of fashion, known at patchworks, and he created pieces that would later become revered as pure classics. Cavalli’s work realized more international fame and success when Brigitte Bardot made the world aware of his talent by wearing several of his designs on her vacations in St. Tropez on the Cote d’Azur. In 1972 Roberto Cavalli unveiled his first fashion line in his hometown of Florence at the Palazzo Pitti. Unfortunately for Cavalli, his first public presentation was not received with appreciation and praise. Florentines considered his use of denim less than fashionable, since the fabric had not been previously part of the high fashion world. However, Cavalli continued his perseverance of using unusual fabrics and went on to became one of fashion’s elite designers. In 1980, he incorporated the support and assistance of his wife, Eva Duringer, a former Miss Universe, to catapult his work onto the world stage. She is today an able partner in his business empire. Through her encouragement, he maintained his unconventional style to create some of fashion’s most coveted designs, using the same fabrics, animal prints and designs that he used in his earlier days. The first Cavalli show that opened the way for real success was held in Milan in 1994. Staying true to his artisan roots and tying it to new technology, Cavalli’s career took off. His expansive fashion house includes menswear and womenswear, childrenswear, underwear and casual lines, as well as eyewear and timepieces. Cavalli’s place of birth, Tuscany, provides the ideal soil for the grapes grown to create the region’s world-renowned Chianti wine. Cattle are also featured heavily in the region’s food production. Chianina cattle is one of the oldest breeds of cattle in the world, as well as one of the largest, producing prized Fiorentina beef for bistecca alla fiorentina (a T-bone steak brushed with olive oil and grilled). Game meats and fowl, fish, pork, beans, figs, pomegranates, rice, chestnuts and cheese are all staples on the Tuscan table. The coveted white truffle abounds in the region. Osso bucco is a well-known favorite, as are finocchiona (a rustic salami with fennel seeds), cacciucco (a delicate fish stew), pollo al mattone (chicken roasted under heated bricks), and biscotti di prato (hard almond cookies made for dipping in the local dessert wine, vin santo). Borlotti beans, kidney-shaped and pink-speckled, provide a savory flavor to meatless dishes and cannellini beans form the basis for many a pot of slowly simmered soup. Breads are many and varied in Tuscan baking, with varieties including donzelle (a bread fried in olive oil), filone (an unsalted traditional Tuscan bread) and the sweet schiacciata con l’uva (a rolled dough with grapes and sugar on top). Pastas are not heavily relied upon in Tuscan cooking but pappardelle (a wide egg noodle) is one of the region’s few traditional cuts. Pecorino Toscano cheese is native to Tuscany. As is true for all steak, to ensure a juicy, flavorful steak that cooks quickly, have the meat at room temperature before starting. Use a grill or thick cast iron pan and make sure that they are very hot. Always let the meat rest, at least 5 minutes, before carving and a sharp knife will glide right through. Let the steak rest outside the refrigerator for 30 minutes before cooking. Use a hot, clean, oiled grill. If pan roasting, preheat the oven to 450 degrees F.
Liberally season the steak with the salt and pepper, coat with olive oil and press the seasoning into the meat. Grill the steaks for about 5 to 6 minutes on each side for medium rare. The fillet will cook a little faster than the strip loin. Move the steaks every 2 minutes or so for even cooking and a crispy exterior. For pan roasting, heat a cast iron skillet with a little olive oil until smoking hot. Turn on the fan, open the window and stand back to avoid getting splattered! Using tongs, place the steaks in the center of the pan. Cook until the first side is seared brown, about 4 minutes. Turn the steaks and place the pan in the oven until the steaks are done, about 6 minutes for medium rare. Remove the steaks to a carving board and let rest for at least 5 minutes before carving. Cut the meat away from the bone and carve into 1/2-inch slices. Arrange the meat on warmed plates and drizzle a little bit of balsamic vinegar over the slices. Serve with some extra sea salt on the side. Born in Rome in 1943, Laura Biagiotti got her start in the fashion industry by helping out at her mother, Delia Soldaini, in her dressmaking business. Laura enjoyed her job for a while but soon grew restless doing work for other designers and wanted to create fashions in her own name. Her big break came in 1965 when a deal was made between herself and experienced designer, Angelo Tarlazzi, to produce a line of ready-to-wear clothes for women. First shown in 1972, Biagiotti’s fashion line was successful immediately. Soon after she took over a cashmere company and created new garments from the yarn. This earned her the name “Queen of Cashmere” in the fashion world. Biagiotti’s designs were well received because she was very conscientious about producing clothes that not only flattered women’s individual figures but were comfortable and fun to wear. Her trademark soon became soft tailoring and loose fitting dresses complete with topstitching and tiny pleats. She was one of the first to introduce the idea of coordinates and of wearing the same garment from morning to evening. Her first collection had such limited garments that she had to use the same white jacket for three ensembles and this gave birth to the concept of wearable co-ordinates in a Biagiotti wardrobe. The Laura Biagiotti woman’s look is all about youthfulness of spirit combined with distinction and luxury. She has learned from the Italian tradition and said, “Elegance, taste and creativity have belonged to the Italian tradition and character for centuries and I share this privilege with all other Italian designers.” The Laura Biagiotti look is tasteful and conservative, yet creative in its details. Biagiotti is known for trying on her own creations and not being satisfied until she knows every single piece of clothing is practical and comfortable for the women who will be buying her clothes. She often instructs the people who work on her team to try them on as well. This also goes for her men’s line- Laura Biagiotti Uomo which was launched in 1987. However, her clothing lines don’t stop there. Biagiotti has a line for women’s sizes larger than 14 called Laura-Piu and a children’s line as well, Laura Biagiotti Junior. It is interesting to note that every Biagiotti woman’s collection features a series of comfortable, relaxed “baby doll” dresses and pants that have elastic waistbands. Laura has won recognition and a number of awards from Italy and abroad: the New York Woman of the Year award in 1992, the Marco Polo award from Beijing in 1993, the Knight of Labour award from the Italian President in 1995 and several more. Laura Biagiotti was married to Gianni Cigna, President of the Biagiotti Export S.p.A., who passed away in 1996. Biagiotti’s place of birth, the region of Lazio, is bordered on one side by the Tyrrhenian Sea and sits in almost the very center of Italy. This region has long been important for its food, wine, politics, architecture and art. With the provinces of Viterbo and Rieti to the north of Rome and Latina and Frosinone to its south, the mountain-to-sea terrain offers a rich variety of landscapes. Oxtail, veal, pork, lamb, spaghetti, gnocchi, bucatini, garlic, tomatoes, truffles, potatoes, artichokes, olives, grapes, buffalo mozzarella and pizza are all abundant here. Add to this a heavy influence of Jewish culture and unique flavor combinations emerge: pork with potato dumplings; artichokes stuffed with mint. The process has been evolutionary, fusing the basic with the indulgent, the readily available with the rare, the common with the Kosher. Very little is wasted in Lazian cooking and the results are nothing less than extraordinary. The Amatriciana sauce takes its name from Amatrice, a small town of the Lazio region in the municipality of Rieti. The use of tomato for the preparation distinguishes it from gricia, another sauce based on pork cheek (guanciale) and pepper. The addition of tomato, linked to the use of long pasta such as bucatini (long, hollow tubular pasta) or spaghetti, is traditionally Italian. Amatriciana sauce is normally served in Rome with bucatini pasta and sprinkled with Pecorino Romano sheep’s milk cheese, while in Amatrice it traditionally accompanies spaghetti. Slice the bacon and cut it into small rectangles, put into a skillet with a little water and cook until crisp. Remove the bacon with a slotted spoon and set aside. Add the tomatoes to the fat in the skillet along with the crumbled chili and salt and pepper to taste. Cook for 10 minutes. Then put the bacon back into the sauce, to warm it slightly. Cook the bucatini pasta in salted water until “al dente”, drain and dress with the Pecorino and the tomato sauce. Mix well and serve hot. The leaves of the anise plant can be used as an herb. The seeds of the anise plant, called aniseed or anise seeds, are used as a spice, either ground or whole. Despite its similar name, anise is not related to star anise, which is another spice from a different family of plants. Anise is used in a variety of baked goods and desserts, for example, Italian biscotti. Anise seeds are, also, the basis for a number of alcoholic beverages, including absinthe, anisette, ouzo and sambuca. Anise has been used for centuries and has been mentioned in ancient herbal mixtures, as well as in texts on medicine, folklore, cookery, confectionery, perfumery and witchcraft. Pliny, in his treatise on natural history, mentions anise and states that the best was grown on the Greek Island of Crete. He also tells us that anise was used to alleviate headaches, soothe the stomach, clear the eyes and treat colics and coughs. Pliny, as well as Pythagoras, also strongly recommended anise steeped in wine as a remedy against scorpions. The ancient Romans used anise to flavor cakes. They often served these spiced cakes, called mustaceoe at the end of feasts, as a digestive. This tradition of serving cake at the end of festivities is the basis for the tradition of serving cake at weddings. Some other historical facts, include: Democritus noted that anise was a cure for melancholy. In England, under King Edward I, anise was used to pay taxes and in Italy anise was helpful for nursing mothers. In old astrology treatises, anise was associated with the planet, Mercury, and according to old plant-lore it protected the lungs. Apparently, anise was also used to ward off evil and was kept in a small pouch under the pillow to avoid nightmares. Anise seed has a faint licorice taste that is common in Mediterranean cooking. Its formal name is pimpinella anisum and it is in the biological family, Apiaceae — the same family as parsley, dill, coriander and cumin. Both seed and leaves carry the plant’s distinctive licorice taste, but the seeds are usually the only part that humans consume. The anise plant is an annual plant, which means that it typically survives for just one season — it sprouts in the early spring, is at the height of its seed production in the midsummer and dies back in the fall. The seeds it drops on the surrounding ground are its primary means of reproduction. Anise is a bushy plant that commonly grows to at least 3 feet (about 1m) in height and has feathery, dense leaves. In the early summer, these leaves give way to white flowers that will ultimately produce the sought-after seeds. The plant is native to the coastal areas of the Mediterranean, including France, Italy, Greece and Turkey; it is also commonly seen in parts of North Africa. So long as the plant has good soil, regular sun and a generally constant climate, it can thrive in a range of places and is grown pretty much everywhere in the world today. Many growers even have good luck cultivating it indoors. It is a non-toxic plant, which makes it attractive for gardeners with young children or pets. Dog owners should use a bit of caution, though — dogs often respond to aniseed the way cats do to catnip, that is, by becoming hyperactive. Despite its near worldwide cultivation, anise remains most popular in recipes from the Mediterranean region. It is very common in baked goods such as breads, cakes and cookies; its slight sweetness adds a complexity and an interesting dimension to otherwise “ordinary” recipes. Many cooks will also add it to soups, stews and savory sauces for similar reasons. The seeds tend to open up when simmered, which can release many of its essential oils. The fragrant Italian cookies made with anise seeds, often called angelonies or angelettis, are pillow-like and rich with eggs and either crushed anise seeds, anise extract or both. They are usually iced with an icing and dotted with tiny nonpareils. 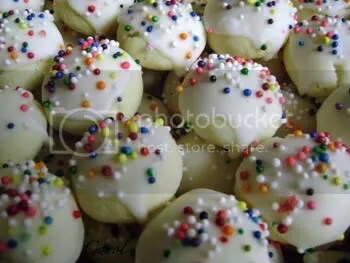 These cookies are traditionally served at both Easter and Christmas and at Italian weddings. A bite of an angellotti cookie will bring back any Italian American’s memories of childhood. Pizelle are another Italian cookie flavored with anise seed. Pizzelle are light crispy cookies which are baked on a cooking surface similar to a waffle iron. They should be stored in airtight containers to keep them crisp. Anise seed are also often found in crisp Italian biscotti and the combination of anise and almond is especially delicious! Preheat oven to 375 degrees F. (190 degrees C). Grease and flour a 9x5x3 inch greased loaf pan. Bake for about 20 minutes or until a toothpick inserted in the center comes out clean. Do not turn off the oven. Remove bread from the pan and slice into 16 slices about 1/2 inch thick each. Place slices on a baking sheet and bake for 5 minutes until bottom is browned, turn and bake for another 5 minutes until the other side is browned. Boil the water, caraway and anise seeds for 5 minutes. Pour into a large mixing bowl. Cool to warm. Then add the molasses, brown sugar and shortening. Add yeast. Mix in all purpose flour and salt. Let rise, covered, for 1-1/2 hours in a warm place. Add the rye flour gradually. If sticky add a bit more flour, but not too much, since rye flour soaks up water more slowly than regular flour. Form into 2 equal round loaves; let rise until doubled on parchment covered baking sheets. Preheat the oven to 325°F. Lightly grease two heavy cookie sheets or line with parchment paper. In a large bowl, beat together the eggs, egg yolks and sugar until light, about 2 minutes; the mixture will look somewhat curdled. Beat in the vanilla, anisette and anise seed. Beat in the dry ingredients, then the chopped nuts. Divide the dough into four equal portions. On a lightly floured board, shape each portion into a flat log, just about the length the cookie sheet. Place two rolls on each cookie sheet. In a small bowl, beat the egg white with a fork until frothy. With a pastry brush, glaze each log with some egg white and sprinkle with granulated sugar. Bake for 15 to 20 minutes, or until the logs are lightly golden brown, firm to the touch and just beginning to crack slightly. Store in an airtight container. They will keep up to about 2 weeks. Beat together butter and sugar until creamy. Stir in anise and lemon extract. Add dry ingredients – blend together. Add egg. Blend. Form dough into 1-inch balls and place 2 inches apart on ungreased cookie sheets. Cool and glaze. Mix powdered sugar with enough milk (2-3 teaspoons) to make a thick glaze. Top with sprinkles. Dissolve the yeast in warm water and add 1 2/3 cups of the flour and knead until a soft dough is obtained. Set aside to rest for 2 hours. Combine the remaining flour with the 1/2 cup sugar, egg yolks, 3/4 cups butter and salt. Work until a soft and homogenous dough mixture is obtained. Add the dough made earlier and continue to work it in until the dough is smooth and soft. Butter and dust a medium-sized round baking pan with flour. Roll out the dough to the size of the pan and place the dough in the baking pan. Cover with a cotton kitchen towel and let the dough rise for 45 minutes. Parmigiano Reggiano, Tortellini, Bolognese Sauce and Balsamic Vinegar of Modena are all famous foods of this region. A vast, wealthy region located in northern Italy, Emilia-Romagna is rich in meats and pastas. The craft of curing meat is held in high esteem here — Italy’s best known meat product, Prosciutto di Parma, is created in Emilia, as is the “king of cheeses,” Parmigiano Reggiano. The richness and complexity of first and second courses served in this region balance each other out, with one being richer and having more complex flavors than the other. Emilia-Romagna meals layer flavors, with pastas that range from tagliatelle (golden egg pasta) to tortelli (stuffed pasta), to tortelloni (larger) and spinach pasta. Antipasto is optional before the first course of a traditional meal and may feature anything from greens with prosciutto and balsamic vinegar or pears with Parmigiano-Reggiano cheese and balsamic vinegar. Pasta is often the first course, including lasagna and cannelloni. Risotto dishes or soups – such as tomato & cauliflower or fresh spinach are popular. Sauces based on prosciutto, or fresh mushrooms may dress tagliatelle, however, tomato sauces are the favorite pasta topper in this region. The famous meat sauce typical of the Bologna area, known in Italy as Ragu, is usually referred to as, Bolognese Sauce. On restaurant menus, one can usually this sauce served over spaghetti, linguine or fettuccine. Seafood, poultry and meats comprise the second course. Chicken is the most popular meat: from pan–crispy chicken with rosemary, to chicken cacciatore over polenta or potatoes and capon at Christmas. Residents throughout the region eat rabbit and serve more pork than beef, such as pork tenderloin with marsala sauce. Along the Adriatic coast, in Romagna, seafood appears frequently in dishes, such as, clams with balsamic vinegar. From grilled asparagus and Parma ham salad to basil and onion mashed potatoes to roasted beets and onions, vegetables play a major role in Emilia-Romagna side dishes. Residents boil, sauté, braise, bake or grill radicchio and other tart greens. They also serve a variety of other vegetables, including sweet fennel, wild mushrooms, zucchini, cauliflower, beets, tomatoes, potatoes, peppers, onions, chard, sweet squashes, cabbage, eggplant, green beans and asparagus. Sweet pastas may be a dessert or a side dish. Rich, decadent tortes, almond and apple cream tarts, sweet ravioli with winter fruit and strawberries in red wine, often find their way to the table. More contemporary offerings include semifreddos, with a texture somewhere between soft serve ice cream and frozen mousse and a sorbet made with Muscat wine. Fresh chestnuts also appear in many desserts, especially at Christmastime. Some differences do exist in the cuisine between Emilia and Romagna. Located between Florence and Venice and south of Milan, Emilia’s cuisine demonstrates more northern Italian influences and capitalizes on the region’s supply of butter, cream and meat that is usually poached or braised. The Romagna area includes the Adriatic coast, part of Ferrara province and rugged mountain ranges. Food preferences follow those found in central Italy, more closely, with olive oil used as a base for many dishes with plenty of herbs and a preference for spit roasting and griddle baking. Melt butter with oil in heavy large pot over medium heat. Add the next 4 ingredients. Sauté until vegetables are soft but not brown, 12 to 14 minutes. Add beef, sausage, pork and pancetta. Increase heat to high. Cook until meat is brown, breaking into small pieces with back of spoon, about 15 minutes. Stir in milk, wine and tomato paste. Reduce heat to low. Simmer until sauce is thick and juices are reduced, stirring occasionally, about 1 hour and 15 minutes. Season with salt and pepper. Cook pasta in very large pot of boiling salted water until just tender, but still firm to bite, stirring often, 4 to 5 minutes. Drain, reserving 1 cup cooking liquid. Return pasta to the same pot. Add enough warm Bolognese sauce to coat pasta and 1 cup cheese. Toss over medium heat until heated through, adding reserved cooking liquid by 1/4 cupfuls, if dry. Adjust seasoning. Make pasta in two batches. Place 2 1/2 cups flour and 3/4 teaspoon salt in processor; blend 5 seconds. Whisk 3 eggs, 3 yolks and 3 tablespoons water in a bowl. With machine running, pour egg mixture through the feed tube. Blend until a sticky dough forms, adding additional water by teaspoonfuls, if dry. Scrape dough out onto floured work surface. Knead dough until smooth and no longer sticky, sprinkling lightly with flour, as needed, if sticky, about 8 minutes. Shape into ball. Cover with plastic wrap and let rest 45 minutes. Repeat with remaining flour, salt, eggs, yolks and water. Divide each dough ball into 4 pieces. Cover dough with plastic wrap. Set pasta machine to widest setting. Flatten 1 dough piece into a 3-inch-wide rectangle. Run through the pasta machine 5 times, dusting lightly with flour, if sticking. Continue to run dough piece through machine, adjusting to the next-narrower setting after every 5 passes, until dough is about 26 inches long. Cut crosswise into 3 equal pieces. Run each piece through the machine, adjusting to the next-narrower setting, until strip is a scant 1/16 inch thick and 14 to 16 inches long. Return machine to the original setting for each piece. Arrange strips in a single layer on sheets of parchment. Repeat with remaining dough. Let strips stand until slightly dry to touch, 20 to 30 minutes. Fold strips in half so short ends meet, then fold in half again. Cut strips into 2/3-inch-wide pappardelle. Tie the pork loin with butcher’s twine, so it will keep its shape as it cooks. Peel the onion and chop it with the rosemary, marjoram, parsley, chives and thyme. Heat 3 tablespoons of olive oil in an ovenproof pot and brown the meat on all sides. Turn the burner off. Heat 2 tablespoons of the oil and the butter in a small saucepan. Stir in the onion mixture, sauté for a minute or two and then let the mixture cool. Distribute it over the pork loin and add the broth..
Place the pork in the oven and roast the meat for an hour, spooning the pan drippings over it occasionally. Remove it to a cutting board and cover with foil. Stir the cream and the vinegar into the roasting pan drippings and reduce the sauce briefly. Slice the meat, putting the slices on a warmed serving platter. Spoon the sauce over the meat and serve. Melt the butter in a deep 14-inch sauté pan over a medium-high heat. Add the spinach by the handful to the hot pan and cook until it is wilted and there is no liquid left in the pan, about 5 minutes, stirring often. It may seem like all the spinach won’t fit at first, but as it wilts, it will shrink to fit. Season the spinach with the salt, pepper and nutmeg, lower the heat to medium-low, and cook 15 more minutes, stirring once in a while. Add the Parmigiano and stir until it is melted through. Cook 5 minutes more and serve hot. Preheat oven to 350 degrees F. Coat a 9 x 2-inch springform pan with cooking spray, dust with cocoa, tapping out the excess and fit a sheet of parchment paper in the base of the pan. Butter the paper. Set the pan aside. Melt the dark chocolate with the butter in a double boiler pan. Whisk the egg yolks with sugar until creamy. Finely chop the toasted almonds and add them to the egg mixture; add the coffee, rum, melted butter and chocolate. Mix well. Whip the egg whites until stiff and fold them into the chocolate mixture. Pour the mixture into the prepared pan. Bake for 35 to 40 minutes or until a cake tester inserted in the center is slightly damp. Remove the pan from the oven and set on a cooling rack. Cool completely. Carefully run a butter knife along the inside edges of the pan and release the spring. Remove the pan sides. Place the cake on a serving dish. Put the confectioners’ sugar in a small sieve and dust the top of the cake. Ricotta is made from the whey drained from such cheeses as mozzarella, provolone and other cheeses. American ricotta is generally made with a combination of whey and whole, low-fat or skim cow’s milk. Ricotta is a fresh, soft, snowy white cheese with a rich but mild, slightly sweet flavor. The texture is much like a grainy, thick sour cream. Ricotta is naturally low in fat, with a fat content ranging from 4 to 10 percent. It is also low in salt, even lower than cottage cheese. Since ricotta is made primarily from lactose-rich whey, it should be avoided by those who are lactose-intolerant. Ricotta cheese, which is generally recognized as having been invented in Sicily, is known in the language of the island by another name: zammatàru, a word in Sicilian meaning “dairy farmer.” This word is derived from the Arabic za’ama, meaning “cow,” leading to the supposition that ricotta might have its origins in the Arab-Sicilian era. Professor Santi Correnti, chairman of the history department of the University of Catania and a well known historian in Sicily, writes that during the reign of the Sicilian king, Frederick II, in the early thirteenth century, the king and his hunting party came across the hut of a dairy farmer making ricotta and asked for some. Frederick pulled out a loaf of bread, poured the hot ricotta on top and advised his party that “cu’ non mancia ccu’ so’ cucchiaru lassa tutto ‘o zammataru” (Those who don’t eat with a spoon will leave all their ricotta behind). There are many recipes for homemade ricotta. Here is an easy one. Slowly bring milk, cream and salt to a rolling boil in a 6-quart heavy pot over moderate heat, stirring occasionally to prevent scorching. Add lemon juice, then reduce heat to low and simmer, stirring constantly, until the mixture curdles, about 2 minutes. This recipe for baked ricotta cheese is easy and is delicious spread on a baguette. Serve alone or with olives and salami on the side. Buying high-quality fresh ricotta can make a huge difference in texture and flavor. If possible, buy your ricotta from a cheese shop rather than pre-packaged ricotta at the grocery store. You’ll notice a difference in flavor and texture. Mix the fresh herbs and salt into the ricotta. Fill a small baking dish with the misture. A small ramekin or mini-tart pan works well. Drizzle the olive oil on top. Bake for twenty minutes. If the top doesn’t brown, finish the dish by placing it under a broiler for a few minutes until it’s browned and bubbly. Place rack in the middle of the oven. Line 16 muffin pans with paper liners or spray with a non stick vegetable spray. In a medium sized bowl, whisk the ricotta cheese and then add the eggs, one at a time, beating well after each addition. Add the milk, vanilla extract and cooled, melted butter, mixing well. Set aside. In a large mixing bowl, whisk together the flour, sugar, baking powder, salt and cocoa powder.Add the ricotta mixture to the flour mixture. Stir just until combined and then fold in the chocolate chips. Place in the oven and bake about 20 minutes or until lightly browned and a toothpick inserted in the center of a muffin comes out clean. Place the dough in an oiled bowl and turn to coat. Position rack in the lower third of the oven; preheat to 450°F. Brush oil over a large pizza pan and sprinkle with cornmeal to coat evenly. Combine ricotta, Parmesan, salt and pepper in a small bowl. Stretch dough to the edges of the pan or roll out the dough to the size of the pan and transfer the dough to the pizza pan. Cover the dough with the ricotta mixture. Scatter with broccoli and sprinkle with Cheddar cheese. Bake until the crust is crispy and the cheese is melted and starting to brown, 15 to 20 minutes. Arrange rack in lower third of oven and preheat to 350°F. Grease an 8″ springform pan with 2 1/2″-high sides with butter. Sprinkle crumbs over buttered pan to coat. Tap out excess crumbs. Place drained ricotta in the bowl of a food processor. Purée for 15 seconds. Scrape down the sides of the processor; purée until smooth. Add cream cheese; purée until smooth. Add the sugar and all other ingredients; purée, scraping down sides occasionally, until smooth, about 30 seconds. Scrape batter into prepared pan. 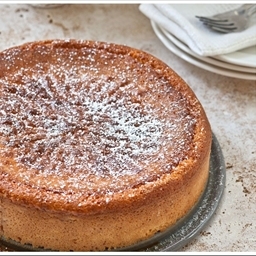 Bake cheesecake until golden brown and just set, about 1 hour 15 minutes. Transfer to a rack and let cool in pan (cake will fall slightly). Refrigerate uncovered until cool, about 3 hours. Then cover and chill overnight. To serve, remove pan sides. Dust with powdered sugar. Cut into wedges. Preheat the oven to 350°F. Rub a generous amount of soft butter on the inside of a 9″ pie pan at least 1 1/2″ deep; use a deep-dish pan, if you have one. If your pie pan isn’t at least 1 1/2″ deep, substitute a 9″ square pan. To make the crust: Place the graham crackers, sugar, almonds and salt in a food processor or blender and process until ground. Pour the crumbs into the pan, tilting and shaking the pan to distribute the crumbs across the bottom and up the sides of the pan. Place the pan on a baking sheet, to make it easy to handle once you’ve added the filling. To make the filling: Mix together all the filling ingredients in an electric mixer and beat slowly until well combined. Pour the filling into the pan; it will come nearly to the lip of the pan. Bake the pie for 45 to 50 minutes, until brown around the very outside edge and an instant-read thermometer inserted into the center registers 160°F. The pie will still look quite unset in the center. Remove the pie from the oven and cool it to room temperature. Once it’s cool, refrigerate until chilled. Serve with your favorite fruit topping, if desired.